In slightly less than two years, Apple’s iPhone has transformed how the world thinks of cellphones. Phone companies and hardware-makers alike have rushed to ape the iPhone’s touchscreen interface, easy access to the Internet, and bustling App Store. The iPhone is no longer the mind-blowing, category-busting product it was in the summer of 2007. Our minds have been blown, the category was busted, and now competitors such as Palm, Google, Nokia, and Research in Motion are fighting back. In the face of the stepped-up competition, it’s possible to consider Apple’s new iPhone 3GS a minor step forward for Apple. After all, it looks almost identical to its predecessor, which itself offered very few changes from the original iPhone model. But with the iPhone 3GS, combined with the iPhone OS 3.0 Software Update, Apple has addressed all of its product’s key weaknesses while adding several important new strengths. Yes, the competition is much closer to Apple now than it was two years ago. But the iPhone 3GS makes it clear: Apple is still leading the pack, in most cases by a wide margin. Externally, Apple hasn’t messed with success—the iPhone 3GS is almost completely indistinguishable from the original iPhone 3G model, which itself was remarkably similar to the original iPhone. Front and center is the iPhone’s signature feature: a bright, beautiful high-resolution 3.5-inch diagonal touchscreen, offering a resolution of 480-by-320 pixels. 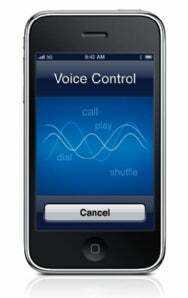 The iPhone 3GS has Apple’s usual complement of four physical buttons (Home just below the touchscreen, sleep/wake up top, a volume up/down rocker on the left side, and a ringer toggle just above the volume controls) and the same black or white plastic back shell introduced with the iPhone 3G. Beyond the color-matched lettering, which shows a uniquely Apple-like attention to detail, the only other change to the outside of the device is the addition of an oleophobic coating to the device’s touchscreen. When Apple designed the iPhone to be controlled entirely by touch, the company has had to deal with the unpleasant reality that human beings tend to secrete oil from their pores, as well as stick their fingers in greasy foodstuffs from time to time. The iPhone 3GS’s screen coating is intended to keep fingerprints to a minimum. I’ve never really found fingerprints to be a major problem with the iPhone, since the device’s screen has always been quite bright. But it’s undeniable that in the right lighting conditions, fingerprints can really get in the way—especially when you’re trying to watch a video. The iPhone 3Gs’s oleophobic coating doesn’t make your fingerprints magically fade away. What it does is create an oil-repellant surface that’s easily wiped clean. When I handled an iPhone 3G and an iPhone 3GS with similarly oily hands—olive oil, if you must know, from a pizza I was making—I was rapidly able to dump my grubby prints all over both devices’ touchscreens. After I rubbed the iPhone 3GS screen onto my t-shirt’s right sleeve, it was perfectly clear. In contrast, rubbing the iPhone 3G’s screen on my t-shirt’s left sleeve seemed to leave a thin film of oily residue spread uniformly across the entire surface, rendering everything a bit hazy. Will people buy the iPhone 3GS because it’s got an oil-repellant screen coating? Certainly not. But in adding the coating, Apple combats a weakness—albeit minor—in the design of the iPhone. Given how few changes Apple made to the iPhone’s exterior, this is clearly a company that feels great confidence in its current product designs. Instead of revamping the phone’s look and feel, the company’s designers are instead focused on the little things, like making it easy to wipe off greasy fingerprints. That said, I have to point out that many iPhone users choose to protect their iPhone’s screen from hazards more noxious than oil by using some sort of screen protector. When you see those people on the street, whatever you do, don’t say the word oleophobic. 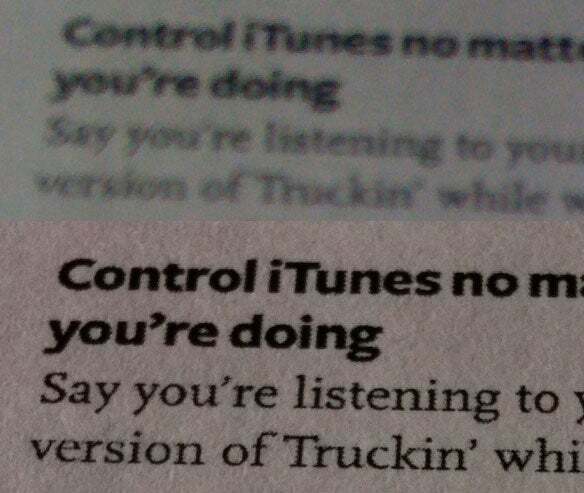 It will just remind them that this is one feature they’ll have no use for. The lack of external changes belie what’s going on underneath the iPhone 3GS’s glass and plastic exterior. The iPhone’s last upgrade added a faster cellular radio and a GPS chip, but otherwise, the iPhone 3G’s internals were largely unchanged from the original iPhone. The iPhone 3GS, on the other hand, is a major step forward in terms of the iPhone’s technological underpinnings. Its processor runs at 600 MHz, compared to previous models’ 412MHz. It’s got 256MB of RAM, compared to 128MB in previous models. While you’ll notice how responsive the iPhone 3GS is thanks to its increased processor speed, the programmers who develop your favorite apps will appreciate the large amount of RAM. The more memory that’s available for iPhone apps, the faster and more stable they will be. Numerous iPhone developers complained about the extremely tight memory conditions in previous iPhone OS devices, which led to slowdowns and plenty of app crashes. With the iPhone 3GS, those apps have twice as much room to breathe. The result should be a faster and more stable system. The speed doesn’t stop with app launches and fast-loading Web pages, either. The iPhone 3GS supports the new OpenGL ES 2.0 standard, meaning that a slew of iPhone game apps will be able to capitalize on advanced graphics features to create higher-quality graphics than have been seen on the iPhone up to now. But more important, the iPhone 3GS is just better when it comes to graphics. Games that featured jerky, low-frame-rate gameplay on the original iPhone and iPhone 3G—we’re looking at you, Crash Bandicoot Nitro Kart 3D—spring to life on the iPhone 3GS with high frame rates and smooth motion. The end result: old games will get new life, and the new games to come will blow away anything you’ve seen so far on the iPhone platform. Sony and Nintendo, be warned. The last component of the iPhone 3GS’s speed is, of course, the speed of the cellular network. Here, Apple’s integrated a new cellular radio that supports the 7.2 Mbps HSDPA specification. Basically, what that means is that the iPhone 3GS will support a new generation of cellular technology that will offer dramatically fast download speeds—once AT&T builds the network to support it. AT&T says it’ll start rolling out that network this fall, but it’ll be a lot longer before it’s widely available. So perhaps it’s safe to say that while your iPhone 3GS won’t seem any faster that previous models on today’s cell networks, it’s got room to grow that the other phones simply don’t have. Now it’s up to AT&T to deliver on that promise. The iPhone 3GS finally addresses perhaps the iPhone’s weakest feature, upgrading the camera to a 3-megapixel model (still not exactly earth-shattering in terms of resolution). It still won’t zoom or flash, and the low-light images it produces are better, but still not great. Still, there’s no denying that this new camera is an improvement on the original. In general I found the images from the iPhone 3GS to be clearer, with brighter colors and sharper definition. A still photo from the iPhone 3GS camera (left) definitely shows more detail and offers better quality than a still from the iPhone 3G (right). Aiding the iPhone 3GS camera’s output is the ability to focus, which the previous iPhone camera lacked. By default the camera auto-focuses on the scene you’re shooting, though you can tap on the touchscreen to make it focus on a particular object. If that object is in a darker or lighter area of the frame, the camera will also adjust to make sure that location is properly exposed, even if that means other areas of the frame will be blown out or left in darkness. The focus isn’t exactly quick, but it does work, and the resulting images are definitely sharper than in previous models. This extreme close-up shows the dramatic improvement in macro shots on the iPhone 3GS’s camera (bottom) compared to the one on the iPhone 3G (top). Then there’s the big news with this new iPhone camera: it shoots video. It’s real video, too—not high-definition, granted, but full standard-def video. To shoot video, you flip the Camera app into video mode by touching a small switch in the corner of the screen and press the big red button. Once you hear a chime and see a time code begin to count upward from zero, you’re recording video. I compared the video the iPhone 3GS shot to the video from my point-and-shoot camera, a Canon PowerShot SD700 IS. The iPhone’s video is much softer than the PowerShot’s, making it pleasant to look at but fairly lacking in detail. However, the audio recorded by the iPhone 3GS was excellent, far better than the (frankly awful) quality of the PowerShot. 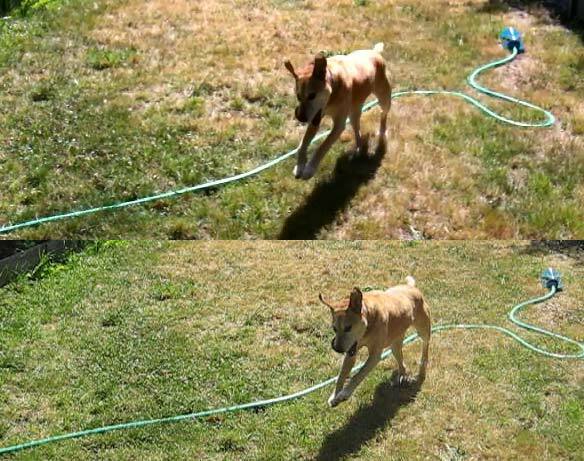 This video still shows the relatively soft iPhone 3GS picture (top) compared to video shot by a Canon Powershot point-and-shoot camera. I asked our Christopher Breen to test the iPhone 3GS against his Flip Ultra, the popular pocket standard-definition camcorder. His results were much the same, with the iPhone 3GS’s video being much softer than the Ultra’s, with bright portions of the image easily blown out in the sunlight. In addition, the Flip Ultra proved to have much superior audio than the iPhone 3GS. 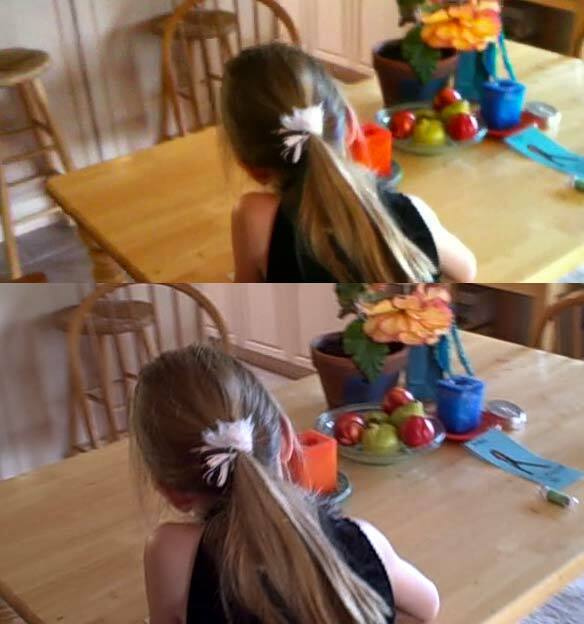 These video stills show that the Flip Ultra (bottom) offers much more detail than the iPhone 3GS (top). Bottom line: the iPhone 3GS shoots decent, albeit somewhat soft, standard-def video. It’s great for shooting video when your iPhone’s the only device you’ve got with you. If you want better-quality video, you probably want a dedicated video camera, ideally one that can shoot in high definition. The new photo/video interface displays videos with an icon and video length; the filtering buttons at top are only available via the Camera app. 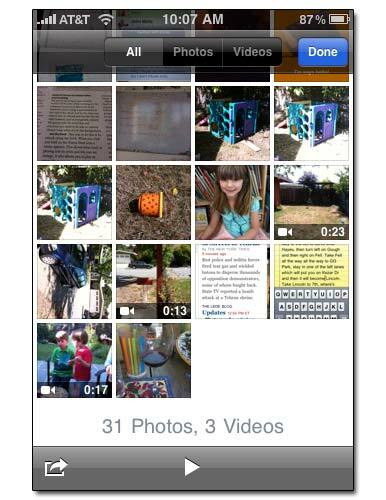 Once you’re done shooting your video, the iPhone 3GS stores them within the (now confusingly named) Photos app. Videos appear in the same grid as still images, but with a small strip at the bottom of their thumbnail image with a small movie-camera icon and an indication of how long the clip is. Once you’ve checked your video and trimmed it if necessary, the Photos app lets you share it with the world by emailing it, sending it to MobileMe, or uploading it to YouTube. Uploading was surprisingly fast and easy. And if you’re not a connoisseur of YouTube, no worries—emailing videos to Flickr and Vimeo worked like a charm, too.